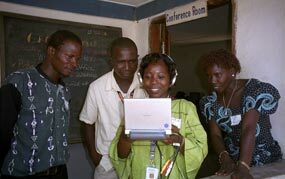 Communication for Change (C4C) has developed participatory video projects in collaboration with communities, government agencies, and grassroots organizations worldwide. Our current project, “Through Our Eyes”, addresses gender violence in conflict-affected areas, and is based upon a multi-country partnership with the American Refugee Committee (ARC) International. Advocates for the welfare of poor women workers in Ahmedabad, India. 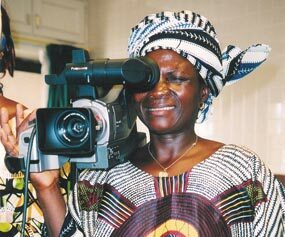 The Video Sabou et Nafa collaboration (2002-2004) supported the efforts of community activists in their struggle against female genital mutilation in Guinea, West Africa. "We go to women in villages to talk with them and hear about their problems. We make video programs about what they say. Then, we play the tape and discuss with them what they can do to solve these things themselves." C4C has formed long-term partnerships with leading non-governmental organizations in several countries. Among these are Action Health in Nigeria; the Self-Employed Women's Association (SEWA) in India; the Coptic Evangelical Organization for Social Services (CEOSS) in Egypt; Banchte Shekha and Proshika in Bangladesh; and CPTAFE in Guinea. These organizations are committed to fostering participatory development; promoting better reproductive health for young people and women; empowering girls and women in civic, educational, domestic and economic spheres; and building advocacy and collaborative decision-making skills in the communities in which they work. Participatory video activities have helped them advance their program goals, share important information among community members, organize in new areas, mobilize constituencies, and promote beneficial change. Initial training focuses on producing programs that are shot in sequence and edited "in-camera." While this approach requires careful planning, it also hones storytelling and organizational skills. Furthermore, it means that some programs can be completed and played back within hours. Based on organizational needs, participants may learn editing skills through subsequent training. Technical competence is only one ingredient in the development of a participatory video team. Interpersonal communication skills are critical in engaging community members in productions, carrying out effective interviews, and facilitating post-screening discussions. C4C training fosters these abilities through role-plays and field practice, in a context of mutually supportive teamwork. Through "Training of Trainer" workshops, C4C ensures that these skills will be imparted to future video team members, thus building sustainable projects. In addition, C4C provides training in critical viewing skills - stressing the importance of "media literacy" and active versus passive viewing of mass-media programming. Training participants include organizational staff and field workers, peer educators, local volunteers, and community members. Learn all about C4C’s current project, Through Our Eyes , as well as past projects in Bangladesh, Eqypt, Guinea, India and Nigeria. © Communication for Change, Inc. 2003-2019. All rights reserved.